The full title of the “Strategic Plan” PDF on the orchestra’s website is “Minnesota Orchestra’s Strategic Business Plan Summary.” Presumably there is a longer document somewhere that explains in greater detail where exactly MOA leadership wants to take the organization and why. Where is this document, and what does it say? WELL, IT TURNS OUT THERE IS NO SUCH DOCUMENT. And it’s not like I was a complete idiot for assuming there is. The PDF file is called “Strategic Business Plan Summary.” At the bottom of nearly every page is emblazoned the words “Strategic Business Plan Summary.” Insinuation: it’s a summary. Plus, the stuff inside it is utterly meaningless glossy pablum. The brightest minds in Minnesota business couldn’t have agreed to this without more detail. Right? WELL, IT TURNS OUT THE BRIGHTEST MINDS IN MINNESOTA BUSINESS AGREED TO THIS WITHOUT MORE DETAIL. So let’s look at the Strategic Plan Summary with fresh eyes, knowing there is no additional strategic plan, and that the supporting documents are embargoed somewhere in the depths of Orchestra Hall, and that we are apparently not allowed to look at them. But there are so many more amazing nuggets of meaningless nothingness to feast upon. “Optimize revenue opportunities in renovated Hall: food/beverage sales, increased Hall rentals.” But – how? Can Hall even legally serve food? Will they have cooks on staff? Will they get a cut from caterers? Is there a caterers’ kitchen? What are food sales going to do? What foods will they selling? What is happening? “Strategically consider new programs to serve the community.” Well – what? Who’s considering? Who’s strategizing? What will the new programs consist of? Does the community have any say in the programs meant to serve them? Because if you want to talk to the community, MOA, I can hook you up with some people. “Initiate national and international touring strategies.” I’m going to initiate strategy for my personal national and international tours. After I’m done writing this entry, I’ll amble over to Kayak.com and see how expensive it might be to fly to London. I don’t actually have to tour; I just need to initiate the strategy to tour. Strategy initiated. Done and done. Check mark. “Dynamic and varied programming.” Question: could you please be more vague? Seriously, though, what is dynamic and varied programming? ABBA tribute bands and a tour stop by American Idol losers? Someone somewhere surely thinks that’s dynamic and varied programming. Who’s to say that opinion is more valid than mine? “Vital holiday and summer festivals.” What the hell is a vital holiday festival? I’VE RAILED ON THIS FOR MONTHS, AND I STILL DON’T KNOW. Sommerfest? What? Henson has been chipping away at the number of Sommerfest concerts for years. What other holiday and summer festivals are there? What makes them vital? “Achieve glow effect of $200,000 in additional earned revenue from excitement surrounding Hall renovation.” A glow effect? What the hell is a glow effect? How do you calculate it? I don’t know! Google it. There’s nothing except Photoshop tutorials. 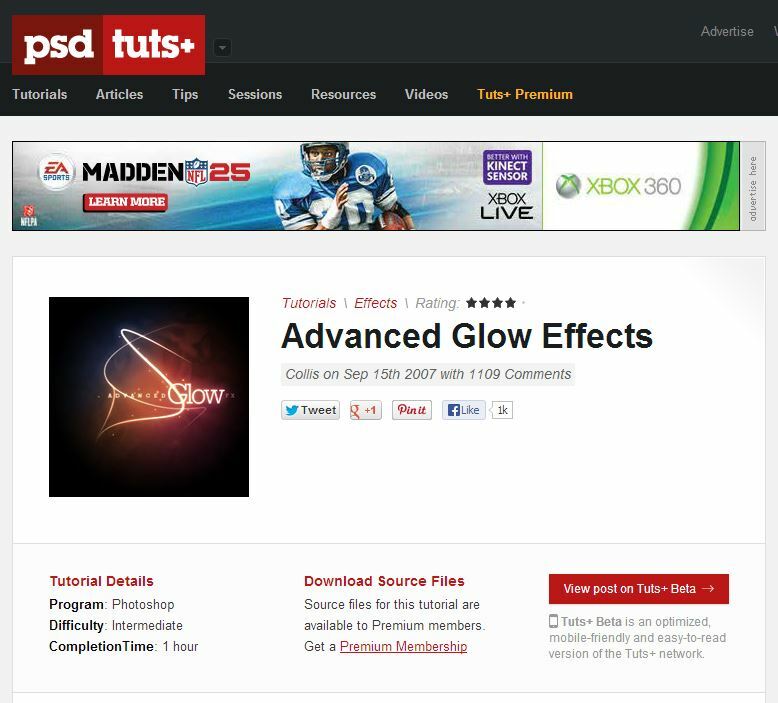 Advanced glow effects. Difficulty: intermediate. If we’re just pulling random numbers out of thin air (or out of other locations), I’m going to say the hall will bring $50 million in glow money. Why? I don’t know. But here’s the scary part: you have just as much of a reason to believe my number as theirs. They don’t, as my algebra teachers used to say, show their work. Supposedly somewhere in Orchestra Hall there are “internal documents” describing how they came to that number. But we’re not allowed to see them. So how was the number arrived at? What, did Michael Henson dictate to a secretary: “There will be a glow effect of $200,000!” and lo and behold it was true? Did they use a Ouiji board? Have a monkey slap a typewriter? NOBODY KNOWS. And that’s just a hint. You can read – or skim; there’s not much to actually read – the entire Minnesota Orchestra 2012-2015 Strategic Plan here. I hear that fundraising professionals in Minneapolis get together, drink, and make fun of this Strategic Plan. That’s how awful it is. It’s an embarrassment. It means nothing. It is garbage. It’s not even a strategic plan, because that insinuates it’s strategic, and a plan. It’s neither of those things. It’s words. On a page. With pictures. And bullet points. NOTHING MORE. I think the thing that amuses me the most about the Strategic Plan Summary is the fact that they so carefully, lovingly, placed the new (well, old) mission statement in the Strategic Plan – and then COMPLETELY IGNORED all of the failed un-achieved goals from the lost 2012-2013 season. To paraphrase Stephen Colbert: This orchestra is not re-arranging deck chairs on the Titanic. No, it is soaring. If anything, this orchestra is re-arranging deck chairs on the Hindenburg! I’m going to assume the “glow effect” is supposed to be new donations triggered by donors enthused about the new lobby. Really? You only expect $200,000 in new donations? Does that reflect the loss of old donations from people like me? I used to give $1,500/year. If Vanska is gone, so is my money. And the recording cycle? If Osmo is gone, I’ll bet that contract is void. These people have no clue what they have done. Emily, I have been engaged most of today going through the just released financial analysis by AKA. The situation is much grimmer than we thought. I’m used to these studies, I used to be on the board of the Grand Forks Clinic and the board of Blue Cross/Blue Shield of ND and was its treasurer. So I have experience of organizations with bigger budgets than the MOA. The fact is that ticket, and donated revenue have been declining for years. The board have been preoccupied with this, especially the sub finance committee. All strategies have failed, and everything cut to the bone. The only thing left is musician salaries. AKA are of the opinion the cuts are not drastic enough. They see no prospect of increasing revenue from any sources. They fault the board for the pre Great Recession pay increases. The draws from the endowment they say are excessive and unsustainable. They plan a 9.5 million draw down for bond repayment in 2015. They are yet to address the source of funds for an equal payment in 2019. One thing I did not know, is that the much maligned lobby remodel was largely paid for by board members personal funds, and they agonized at length on whether to go ahead. It seems the lobby was dangerously overcrowded and limited direct customer sales. The final glory though is that the American Federation of musicians have seriously mismanaged and hugely underfunded the pension plan, not only for our musicians, but all Orchestras that have their pension managed by this incompetent union. To their credit, the Board have been trying to buy the fund back, so our musicians have a pension, but that will mean another 25 million draw down from the endowment. I have to agree with the Board, that the organization is headed to bankruptcy, but faster than any of us thought. AKA feel most American Orchestras are headed to fail, if they don’t drastically cut musician expenses. The musicians should have accepted the board offer, and will regret not accepting it. They can move, but will surely face the same situation or worse where they move to. The only way out I see of this, is to really tighten the belts, and see if the new Internet technology can provide a reliable replacement revenue stream, I think it can, and I know how to do it. I will be happy to show the state of the art and beyond to anyone interested. Your demonstration tomorrow, is a complete waste of time. The boards hands are tied, of that I am now quite certain. If the musicians will not sign a contract, the board’s only option is the American Crystal Sugar solution, and hire replacements. I was close to the American Crystal lockout and had many friends on both sides of the dispute. I strongly advised union members who asked me to settle. Their failure to settle has had disastrous consequences for the union members. The musicians will suffer the same outcome and both have had very poor advice from their unions. Mr. Carter, since you’re so familiar with the AFM pension, perhaps you’d like to elaborate on the funding percentage of the fund? You state that it is severely underfunded. Could you elaborate? Is the $25 million dollar withdrawal penalty a requirement, or a choice? Does withdrawing from the AFM pension guarantee the pensions of the orchestra members? What is the total amount that the MOA paid per year to the AFM pension plan on behalf of their musicians? Are you a member of the AFM pension? What further information do you have? What would the required increase be (in dollars and in overall percenage) to the MOA under the terms of the AFM pension stabilization plan? Which union is advising the musicians? Who votes on the collective bargaining agreement…the entire union, or simply the members of the orchestra? How can you state that everything has been tried and has failed, if the public at large had no idea that the orchestra even needed money and were only told that funds were being needed to renovate the lobby? Who paid for AKA’s assertion that all orchestras are doomed to failure and what if every orchestra DOESN’T go out of business in 5-10 years? “Blogs are senseless and must be ignored (in favor of media we actually own).” <—- this! If the MOA is indeed headed for bankruptcy in a few years, just about every other American orchestra will get there before we do. Also, Web development needs to go a lot further before orchestras can make money off it. The Detroit Symphony loses money on its webcasts. Robert Levine’s article that Kristen links to here is well worth reading. It makes one question the conclusions of the entire report. I’ve also heard from another independent source that the report is seriously, seriously flawed, for a wide variety of reasons. So Mark Carter (or Francis Mark Carter, as you appear on the musicians’ Facebook page commentary), in the words of one of our illustrious board members, “who are you”? Actually, your anti-union rant and credentials as former board member of BCBS North Dakota (your words) make your diatribes against the musicians much more transparent than our board’s “strategic plan”. On a day when the future of a great orchestra is imperiled by a continued needless lockout, I want to thank you for some comic relief. If the situation is this drastic, why has the board and management not involved the musicians and patrons in collaborative problem solving? Why did they lie to audiences and patrons about the financial situation until very recently? Cleveland successfully met its financial challenges earlier this decade by introducing new programming, introducing a residency for the orchestra in another city, and aggressively increasing its audience – and it did all of this without changing its focus on excellence in classical music and while maintaining musician salaries. They key to their success is that they have involved the musicians and patrons in the problem-solving process. The management and board in Minnesota has taken the opposite approach, freezing out the very stakeholders who hold the key to solving these financial problems. My family and I have donated nearly $11,000 to the musicians since the start of the year but are black-listed by the Minnesota Orchestra. The black-listing occurred after I expressed concerns during a fundraising call back in March; we don’t get e-mails, we don’t get letters, and my letters to board members and the orchestra are ignored. Why would I ever donate to the Minnesota Orchestra? If the board and management were truly interested in the long-term success of the orchestra, they would be much more transparent and would involve stakeholders in the problem-solving process. The dictatorial, non-transparent manner in which the massive salary adjustment has been pushed by the board and management will seriously damage ticket sales and donations for years into the future. If you want to make drastic changes, you need to be transparent and involve stakeholders. Without transparency and collaboration with stakeholders, there is no trust. Mark, was there anything in the report about executive compensation, i.e. for Pres. Henson and VP Ebensteiner? When staff and administration expenses were cut, it’s my understanding that neither of these gentlemen were affected, especially Henson. It sticks in my throat that Henson makes about 3 times what a musician makes and has not had to take cuts. Thanks. In Dr Cater’s defense, he has written letters very supportive of the musician’s cause previously. I’m quite surprised that he seems to have made such an about face, but it is likely he has taken the AKA strategies analysis quite seriously. Other financial analysts agree with the serious nature of the above mentioned flaws. The scope and sources list on page 17 is really all one need read. I hope Dr Carter takes the time to research the history leading up to this analysis as well as the timing of its release. For one thing, if management really wanted to have a transparent conversation about finances, as well as negotiate in good faith to reach a settlement as soon as possible, why sit on this analysis for three months? Musicians have long sought a jointly funded, independent analysis including input from others with experience in the industry. One that is broader in scope and more comparative in nature. As I’m sure Dr Carter knows from experience, most orchestras are suffering from similar economic realities, but some seem to have developed more successful strategies for handling them than others. One of the reasons musicians support the current framework in place for mediation is to finally have a way of letting outside eyes have some input. Management has refused this request from the beginning, and that should tell you something, especially in light of the stated goal from the board minutes to show as large a deficit as possible for negotiating purposes. One more thing. The ticket and contributed revenue have only been in decline since 08-09. Most of the declines came in 09 of course, but what is most interesting is their continued decline since. This is in direct contradiction with national trends for orchestras of comparable size. It is also in contradiction with national trends for philanthropy toward arts organizations of comparable size. Notice from the report that most of the information used was from the last 3 years, and only 990’s were referenced from 2007 on. And the above mentioned goal for deficit size was from the minutes in 2009 (or maybe 10) at the latest. See musicians web page for more info. Mr. Williams, You may be right in every financial item you mentioned (may being the operative word). However, the statement that you can hire replacements (qualified) is absolutely untrue and indicates a profound ignorance of the professional orchestra environment. That you are unaware of this makes all your other analysis suspect. are contractual matters that must be negotiated with the union. The Orchestra presently estimates that the current withdrawal liability to exit from the plan would be approximately $25 million. The Orchestra is monitoring the status of the plan and the options available for dealing with the liability. In fairness I suspect a lot of the underfunding is that a lot and probably most are behind in their contributions. The MOA is 25% to 30% behind its contributions, with the only place to make it up is the endowment. I recommend everyone who has a view about this dispute read it. I commend the board for releasing this confidential report to MPR, from whose website I downloaded it this morning. This is a major step to transparency and I fault the board for not coming clean about the problems sooner. I suspect however they felt that if they came truly clean it would significantly reduce donations. This is addressed in the report. Interestingly this report does address the competency of the board in many of its financial decisions and estimates. A lot of their opinions are far from complimentary to the board. However I can tell you no board I have served on has got everything right, far from it. I think this situation is grim. I think if the musicians do not go back to work this month, then we have probably heard the last note from the Minnesota Orchestra. The Board however might just pull it out by hiring a new orchestra and conductor. This will be a stretch, but I suspect they will try and they should. If I were on the board I would vote for that. Now I know the grizzly facts, I think I have been unduly hard on the board and owe them an apology. As for the DSO and their streaming. It is primitive compared to the what is available from Europe. The Met does make money from Met Player. There are two pension plans in use at the Minnesota Orchestra. One is the old pension plan run by the MOA, the other is the AFM-EPF or American Federation of Musicians – Employers Pension Fund. For the purposes of your arguments, you’re combining the two. The AFM-EPF fund is administered by trustees of the AFM and Trustees of the participating employers in cooperation. The MOA’s pension plan was phased out about 20 years ago, I believe, moving to the AFM-EPF and saving the organization millions of dollars. There are some current members of the orchestra who have pension benefits under that old plan, but they stopped accruing those benefits when the plan was ended. They are now accruing benefits in the AFM-EPF. The MOA is not behind on contributions to the AFM-EPF and is not required to withdraw from the plan. The $25 million you are scared about is put there as a scare tactic. It is not required and not necessary. Please take a bit more time to fully understand this. The board has brought the finances to this point and has done a poor job of managing it. There has been talk that the board has tried everything to bring expenses down except for the musicians salaries. That is not true. Has Mr. Henson, Lily Schwartz, Bob Neu and Brian Ebensteiner taken a large pay cut? They should be taking the same percentage of a pay cut as they are asking of the musicians. “…if they came truly clean it would significantly reduce donations.” I disagree with this assessment. I think if the Board has been honest and transparent even pre-2007 about their financial situation rather than lying and manipulating the numbers to benefit their leverage in contract negotiations (which hasn’t worked out the way they thought), had gone to the community and asked for help so the organization would not fail, had treated the musicians as respected partners and enlisted their help in fundraising in the community, and had been 100 times more respectful toward their patrons, I believe the community would have risen to the challenge. Especially considering the value the orchestra adds to the culture of Minnesota. But now? I have yet to hear a patron say they can’t wait to donate to the MOA, especially with Henson still President. This Board and management owe the community a HUGE apology if they want the community to help, in my opinion. Judging from Emily’s exposure of the so-called Strategic Plan as a Potemkin Village it may well be possible that the Orchestra’s finances are indeed in dire straits, as Mark says, but the cause, rather than “having tried everything,” would appear to be endemic mismanagement over a period of years. That’s not good news as it places the prospects for a new contract for the musicians in the very same hands of those who have brought the orchestra to this state of imminent collapse. I wonder in that case, if the mediation efforts of Mr. Mitchell don’t succeed in resolving the situation, whether arbitration might be the best hope for the musicians. Not precisely on topic, but: everybody be sure to read Alex Ross’ two September 5th posts concerning Minnesota on his “The Rest is Noise” blog. One would think that when someone of this national stature lobs grenandes like this, the MOA would take note. One would, apparently, be wrong. I am wondering why no one is discussing Michael Henson’s comment on MPR (9-4-13) that “we want him [Osmo] to stay through to the end of his contract?” If the management of the MOA really believed that Osmo is “astonishing,” Henson would be saying things like “we never want to lose him” or “he is an irreplaceable treasure.” Obviously, Henson’s words reveal that the MOA is planning to do to Osmo what they are now doing to the musicians. The inescapable fact is that Osmo is going to leave. If not now, then in two years when his contract is up. So in one sense, the whole “Osmo leaving in eight days thing” is…maybe…less relevant than it first appears. I mean, it’ll be a devastating blow. But that blow is coming in two years without a doubt, anyway. In this squabble over the Minnesota Orchestra, who speaks for the thousands of supporters who are the intended beneficiaries of the 110 year old institution? An institution that has been debased by its leaders who are only bankers and Philistines and by musicians only salaried workers unwilling to sacrifice. Is there no one to cry out in the words of the Gospel, “How dare you turn this temple into a marketplace”? Musicians, take a cut. 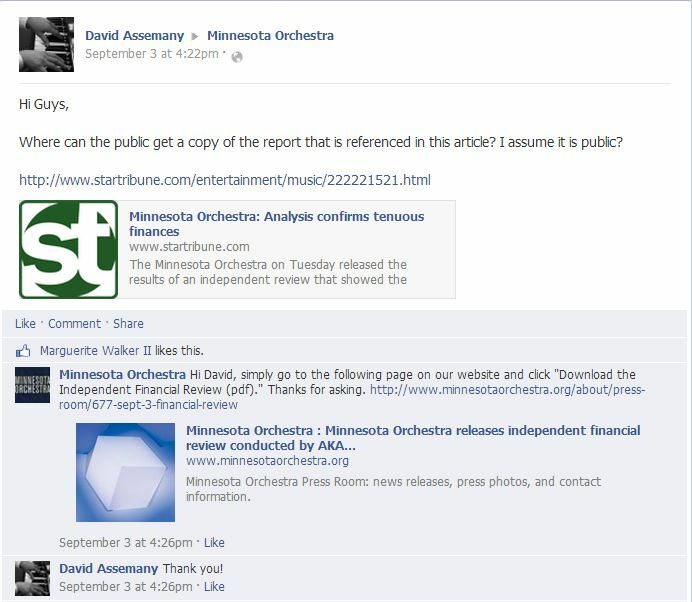 Administrators, stop planning for the respected Minnesota Orchestra to become The Minnesota Pops. All of you debase sacred things.